The Japan-America Society of Indiana and its public relations partner Indianapolis-headquartered Shank Public Relations Counselors, Inc. were awarded the coveted Public Relations Society of America Silver Anvil Award of Excellenceduring ceremonies in New York City earlier this month. 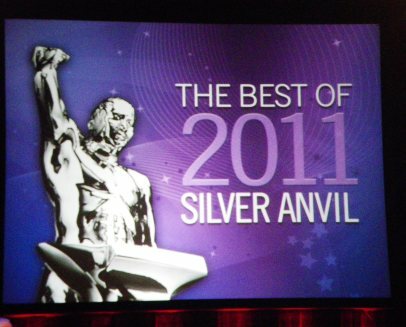 The Silver Anvil competition is the most esteemed honor in the public relations industry, recognizing the best public relations programs of the year and the highest standards of performance in the profession. The nomination honors the results of the 2010 “Bridges to Japan” Indiana State Fair exhibit presented by the Japan-America Society of Indiana (JASI), the Indiana Economic Development Corporation, and the Indiana State Fair Commission. JASI retained Shank Public Relations Counselors to generate trafficand understanding. Using traditional and social media, more than 230,000 people – 26 percent of total fair attendance --viewed the exhibit—2.5 times projections; and based on exit research, positive opinions of Japan increased by 8 percent and knowledge of Japan’s presence in Indiana increased by 24 percent. “The public relations and media support we received from Shank Public Relations Counselors clearly propelled attendance to the “Bridges” exhibition. It was the honor of a lifetime to be recognized at the PR industry’s top awards event, and exciting to participate with companies such as Pepsi Cola, General Motors, Starbucks, Kodak, and Frito-Lay,” said Theresa Kulczak, Executive Director of the Japan-America Society of Indiana. Locally, JASI and Shank Public Relations Counselors were awarded earlier in June “The Best of Show” in the Pinnacle Awards competition presented by the Hoosier Chapter of the Public Relations Society of America. 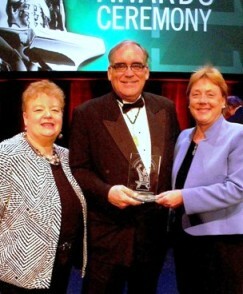 The Pinnacle awards are the local equivalent of the Silver Anvil awards. Pinnacle entries are received from around Indiana by the top public relations organizations including public relations firms, institutions and not-for-profit organizations. Judging is conducted by an out-of-state Public Relations Society of America chapter. David Shank of Shank Public Relations Counselors received the Award of Excellence on behalf of the “Bridges to Japan” Exhibit.